Luxurious Villa with Modern Design,Private Pool and Amazing View. Tinos is the Cycladic island for those who appreciate the simplicity of life. It is located near the geographical center of the Cyclades island complex. Tinos is famous for the authentic, picturesque villages, the hidden, beautiful beaches, the incredible light and shadows, its 80 or so windmills, about 1000 artistic dovecotes and its Venetian fortifications at the mountain, Exobourgo. On Tinos, both Greek Orthodox and Roman Catholic populations co-exist. The island is also well known for its famous sculptors and painters, such as Nicholaos Gysis, Yannoulis Chalepas and Nikiforos Lytras. 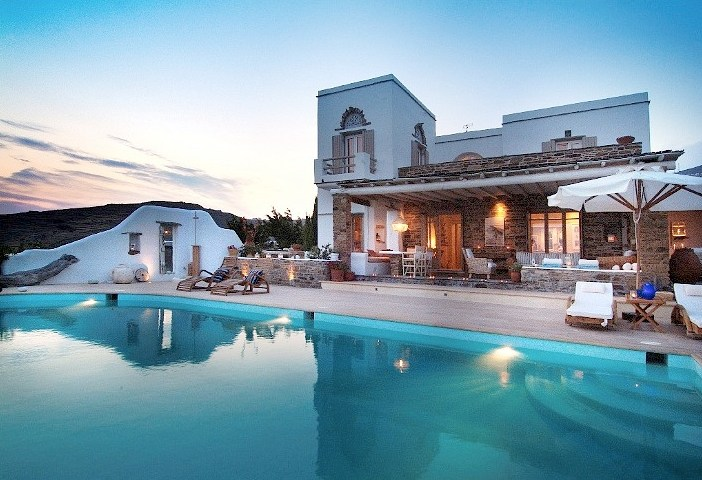 Villa Melia is set on a privilege area on the south side of the island, very close to the well-known Triandaros village. The 200 sq.m. house sits on a large piece of private land. It consists of 5 bedrooms, 5 bathrooms, a big kitchen, living room and dinning room, on two floors. It also has very spacious and comfortable outdoor areas. With the sweeping views of the Aegean Sea from the beautiful infinity pool, you are sure to lose yourself in your private Paradise! There is also a guest house with a king size bed and a built coach, ensuite bathroom, well equipped kitchenette, TV and AC. In total, the property can comfortably accommodate 12 guests. Nearby Attraction: During the period from 3rd century B.C. to the 3rd century A.D. the Temple of Poseidon and Amphitrite flourished at the coastal site of Kionia, west of the present town. According to Strabo the temple was “worthy of goddess”. Dionysus and Poseidon were mainly worshiped during the Prechristian period on the island. The temple of the former was erected on the site where the Evangelistria Cathedral is today. Excavations of the temple of Poseidon were carried out by the Belgian archeologists H.Demoulin in 1902 and P.Graindor in 1905 which brought to light the destroyed temple, its propylaia, altar, bases of statues, aqueducts, baths, a white marble sun dial by Andronicus of Macedonia and so on and so forth.